• 2,387 sq. ft., 3 bath, 3 bdrm single story "Ranch" - MLS® $170,000 - Complete Remodel! Sandy Harbor, Horseshoe Bay - Total renovation just completed. Large, recent addition to home. An amazing value with quality finishes and just across the street from Lake LBJ! Multiple waterfront parks in community including boat ramp, day docks and full park ammenities. Open floor plan, choice of 2 dining or 2 living areas, stainless appliances, all new flooring, fixtures and paint. Huge master suite with all new bathroom. Tons of storage. Large lot with decks/porches/trees and privacy fencing. No hassle, priced to sell! 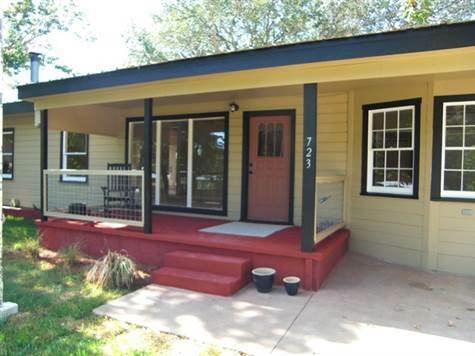 Huge 3/2.5 under $72 per square foot and completely remodeled! Secluded community of Sandy Harbor with excellent lake access. Unique opportunity to live in a beautiful home, outstanding setting, and enjoy Lake LBJ with low taxes. Priced to sell quickly and welcome a discerning buyer looking for true value. Dual AC and water heaters. More closets and storage rooms than you can imagine. Beautiful lot landscaped and xeriscaped in rear. Check out the details in this thoughtful make-over! Compare to homes in the area and entire market. This is a best buy and outstanding investment. Non-greedy owners ready to share their good fortune.